So, back to the kitchen. I had chicken, but in the end felt like veggie. That called for a quick look in the fridge to see what was on hand. Found some pumpkin and a few brussel sprouts along with some basil leaves and there is always plenty of parmesan in our fridge. On the bench I had some walnuts which had been shelled last week and some standby chicken stock in the pantry. 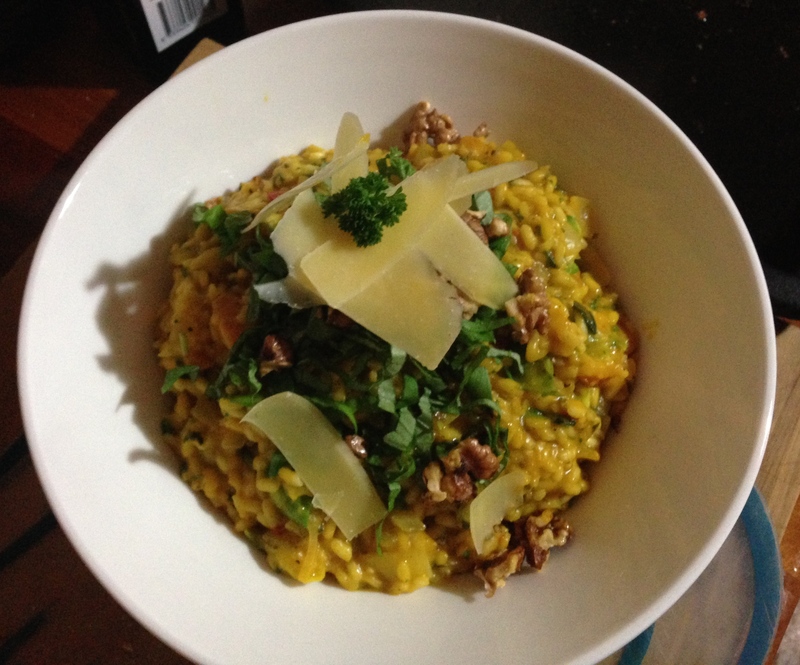 Quick check of the rice supplies, and I figured we were good to go with a Pumpkin, Walnut and Basil Risotto. Mmmm mmm, tastebuds were getting excited. 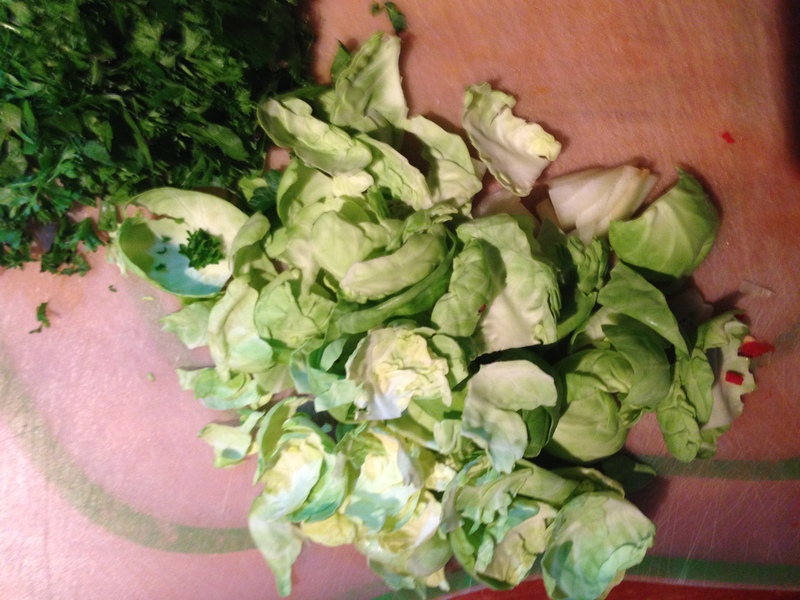 Brussel sprouts – there were about 6 looking lonely in the fridge. I cut off the ends and discarded some of the outer leaves. Pulled off the best leaves and discarded the centres as well. garlic cloves – I used 7. 6 to roast whole, and 1 peeled and cut finely. chicken stock – if you have ‘real’ chicken stock – this would be perfect. My standby is the jelly like little stockpots. If Marco Pierre White is on the packet then it must be good, even if just for the eye candy moment. The packet says one little pot makes about 2 cups, but I think you can stretch it to 3 if you need to. As everyone knows stock should be hot when you ladle it in a bit at a time into your risotto. But don’t stress, I didn’t. And I reckon Mr MWCED probably wouldn’t be able to tell the difference. White wine – whatever you happen to be drinking, hopefully good and hopefully dry. I was enjoying a Villa Maria 2012 Chardonnay – felt a trifle piqued to have to give some away to the risotto! First up, peel and cut the pumpkin into cubes and put into a roasting pan with 6 of the garlic cloves. Drizzle over olive oil and salt and pepper. Put into a hot oven for about 30/40 minutes. You might want to take out the garlic cloves a little sooner than the pumpkin, otherwise they tend to overcook. You want the pumpkin to be soft. (You could peel the pumpkin after it has been roasted, whichever you prefer). When the pumpkin is done, let it cool a bit. Put about half the cubes into a food processor. Skin the garlic cloves and put roasted garlic into processor. Whizz. Maybe add a little water, it should end up being nice and smooth, similar to a thick pumpkin soup consistency. Put the handful of walnuts into the roasting pan the pumpkin has just come out of. The oil in the pan should be enough to mix into the walnuts. Roast them for about 10 minutes. When cooled, chop into medium/small pieces. In your favourite pan, put a little olive oil and the butter. Heat and when spitting put in the arborio. Stir so rice doesn’t stick and until it starts to colour. Then add the onion, one chopped garlic clove (the one you didn’t roast)and the chilli. Keep stirring for a couple of minutes. Add a slosh of wine, keep the heat up so that the alcohol evaporates, just leaving that lovely wine taste. Keep stirring. After a couple of minutes add some of the chicken stock, about 1/4 of a cupful. As the rice begins to absorb the stock keep adding a little more. After about half the stock has been used, add the pumpkin puree and 2/3 of the chopped parsley. Oh my, see how delicious that colour is looking now. The rice has probably been cooking about 15 minutes now – it is starting to plump up but probably still a bit undercooked. Keep stirring and ensure the mixture is constantly kept topped up with liquid. At this stage add the brussel sprout leaves and a handful or so of the grated parmesan. 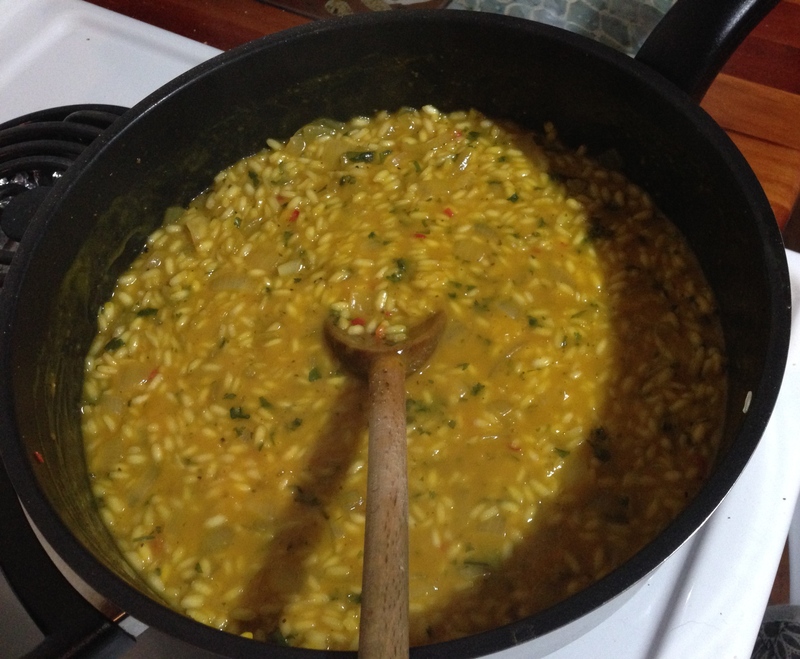 The aim is to have a risotto which is creamy but not too liquid. Salt & pepper to taste. Keep checking the rice, and once it is ‘al-dente’ you are ready to serve. That means it should be firm when bitten, don’t overcook it so it is soft and mushy. Pile it into your chosen bowl, add some of the walnuts, basil, parmesan slivers and parsley to decorate. We usually put little bowls of grated parmesan and parlsey on the table for more top ups, plus tonight I also added a bowl of the roasted walnuts.